The Vapros, the Taurlum, and the Celerius: three dynasties bound by an ancient promise, and given superhuman abilities to protect the city of Altryon from the dangerous world beyond its walls. Centuries of fighting, however, have turned the families against each other. A powerful emperor now rules and each family has suffered heavy casualties in the feud. 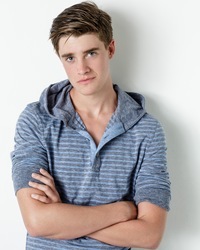 Sixteen-year-old, Neil Vapros desperately wants to become an assassin in order to impress his overly critical father. Despite a failed mission, Neil learns that a new sinister threat has awakened. This mysterious new power will shatter the established order and threaten not only the very lives of these powerful families, but also the once great city of Altryon. 1. Where did you get the idea for the Feud series? This is a coming of age story for young adults and I am a teen in that demographic. Everyone struggles to find their path in life and my characters are all struggling with not wanting to let people down and to find their way; forgiveness and hope is a part of that journey as well. One night, at the age of 15, I had terrible insomnia and I couldn’t sleep. I was thinking about the different personalities of my siblings and myself and how we will all follow different paths. That gave me the idea to create three different families loosely based around our differing personalities. I decided it would be fun to take these families and place them in a fantasy world where the obstacles we all face could be magnified to a whole new level. I wrote out the plot for the three books that night. 2. What drew you to write YA Fantasy? I wanted to write for me. Recently, I’ve hit an “in-between” zone where it’s harder for me to find books I want to read. I wanted to write something that I would want to read and that would appeal to other kids my age. I wanted to appeal to boys who have lost interest in reading and I also created strong female characters that girls will love. I was lucky because I learned to use writing as an escape at an early age. I was in a multi-age program from 1st-3rd grade where I had the same teacher for three years. She had an experimental writing program where she gave us an hour a day to write in our journals. She told us to just write freely and not worry about punctuation or grammar, just let the creativity flow. So by the end of that program, I had a stack of notebooks filled with an adventure series. I also did a series called Three Rings that I wrote from the age of 12 to 14 when middle school was really rough. It was a 200-page manuscript. It wasn’t good, but it was good practice. 4. What are your other interests besides writing? I love stand up comedy because like writing, it requires an ability to look at the world in a unique way and find the humor in that. I’m a varsity swimmer for my school. I’m involved with mock trial, I’m in a number of plays every year, I started an improv club at my school and I’m really involved with our film club—we spend our weekends writing scripts and filming. We are currently working on a web series called “Amockalypse” that I’m really excited about. I pretty much gave up on sleeping after middle school. If you love something, you find the time. I write during any hour that I can get free. With extracurriculars, I don’t usually get home until around 7:00 p.m. or later, and then I have homework, so I may only write an hour or two during the week. I try to make time to write during the weekends and breaks—I get the most writing done in the summer. I started the second book in the trilogy, The Flames, this past summer and am working on editing it over this school year. My family is nothing like the families in the book, I better clarify that up front. My parents are incredibly supportive and have allowed me to follow my dreams. I have two siblings: a brother and a sister. They are great; we are very close. I am the youngest. My brother and I used to fight a lot and that dynamic inspired my idea for the three feuding families in the books. We don’t fight anymore, as we’ve outgrown that phase, but it gave me plenty to write about. 8. What were you like as a child? I lived in a fantasy world all the time—I was always inventing stories and reenacting them. I lived in costumes. I had a cat suit that I particularly loved. My mom would always get me a new costume for Halloween and inevitably I would end up back in my cat suit when it was time to go trick-or-treating. I wore that cat suit until the legs only came to my knees. It’s weird…for some reason when you dress like a cat all the time you don’t make a ton of friends. But anyway, that’s why my parents signed me up for acting classes. I started taking acting classes at the age of six. I loved it from the start. 9. I understand you still have the acting bug. What are you doing now? Currently, my whole focus is on college auditions. I’m crazy enough to be applying for programs where thousands of kids audition and they literally accept only six boys. So it’s kind of like trying to win the lottery, but I’m giving it my best shot. As I mentioned, I’m writing, directing and acting in my web series and we are launching a Kickstarter campaign to fund that this week. I spent last fall in LA and I was so lucky to take acting classes and perform improv at LA Connection. It was like what I imagine grad school is like. I spent 40 hours a week in acting classes and seminars—and still had to keep up with schoolwork online. It was intense but amazing. 10. What's your favorite part of acting? Favorite thing about improv? My favorite part of acting is initially stepping into the shoes of a character and just beginning to break them in: finding out what they want, how they talk, how they move, etc. My favorite part of improv is when you are easing into a scene and the really good lines just start flowing, especially when you’re working with a talented partner. 11. Were you a big reader as a kid? In 5th grade, I started at a new elementary school when I moved to Naples. They had a reading contest for whoever read the most books. I ended up reading like 200 books, which was a bit of overkill as the next highest kid read about 75 books, but apparently I’m more competitive than I realized. I just really wanted to beat this girl in my class who told me she was a better reader. 12. Were you drawn to a certain genre as a kid? 13. Were there certain authors that you really liked? I’ve always loved Rick Riordan, and every kid in my generation loves JK Rowling. My mom started guarding the Harry Potter books and reading them aloud to us, because otherwise I would read one whole book in a night and then tell my siblings what happened. We would barely leave the house until we had finished each book. Suzanne Collins’ Hunger Games series has been phenomenal. 14. How have those writers influenced your writing? I think Rick Riordan introduces and writes characters very well, which is something I kept in mind, because I have a group dynamic with my book. But I really like the way JK Rowling set up the overall plot and carried it through, intertwining a lot of different elements. She knew how to set up a big, epic adventure and finished it beautifully. That is what I hope to do with this trilogy. 15. Do you work with an outline or do you just write? Do you ever get stuck? 16. Do you have a favorite character in The Sparks? 17. If your book was made into a movie, which actors would be cast as the main characters? 18. Can you tell us a bit about the second book, The Flames? One of the big themes of the second book is that no one should get to a point in their life when they should experience a complete absence of hope. Things will always get better. My best friend from childhood committed suicide this year and I really want other teens to understand that whatever seems so overwhelming in your life today, won’t be what’s important to you down the road. When my characters experience this loss of hope, that is when they gain their advanced powers. Something good can come out of something that in the moment seems so terrible. The second book in the series focuses on the remaining family members (spoiler alert!) and their friends, as they begin to kindle the revolution. It’s a lot about personal growth for the characters, like Neil and Darius. Even Robert Tanner, who is a minor character in the first book, comes back and has a very big story arc. It is the book where we start to reach that giant conflict that the characters have been stepping toward in the storyline. 19. 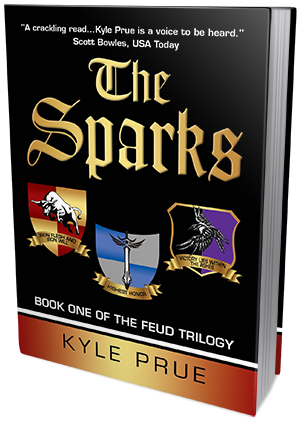 What was your favorite part or chapter to write in The Sparks? 20. How did you come up with the title? 21. How did you pick the names of the families? 22. How did you get the idea for the three families? 23. What can you tell us about the challenges of getting a book published? I went to the New York Pitch Conference and Writer’s Workshop and got the opportunity to pitch my book to Random House, Penguin and McMillan Press. Each requested the manuscript (it was the most requested manuscript at the conference! ), so I felt like I had a sound idea. The conference director advised me to use the publisher interest to try to get an agent. So, I began the process of sending query letters. I got some good advice from the agents I talked to. One advised me to hire a well-respected editor, as publishers expect manuscripts to be perfect, so I did that. Then another agent took the time to really ask me about my goals. I wanted the book to be read by as many people as possible and I wanted to get it published in a timely manner. She explained that—if I was lucky—the publishing process would take 3-5 years. She recommended that I meet with a small, independent publisher with a good reputation. They could meet my timing needs and I would have more input in the process, ensuring that I could retain some creative control of the final product. I met with the publisher she recommended (Barringer Publishing) and we hit it off immediately. So far, I’ve been thrilled with the process. I’m hoping to publish Book 2, The Flames, in late summer 2015. 24. Do you have advice for other high school students wanting to write a book? Yes, never stop writing. Write, and write and write, until you’ve got something that you like. Don’t be afraid to have a very rough copy of something. The editing process is terrible and long and arduous, but it’s something you have to do. What matters is getting something on paper and then really shaping it into what you are looking for. 25. Is there anything you would like to say to your readers and fans? 26. Tell us where we can find your book and more information about you. You can find more info on my website, www.kyleprue.com, Facebook www.facebook.com/kyleprue, Twitter @KylePrue and Instagram @KyleStevenPrue. We have a special discount code for those of you who want to purchase The Sparks. You can purchase the book from Kyle Prue’s store on his official website (linked). The code ‘BLOG25’ will get you 25% off an autographed copy, signed by Kyle Prue! NOTE: This code will not work on purchases made on Amazon.